A lot of the Pampered Chef recipes are very easy. This is one of those recipes, and they are equally as delicious as they are to prepare. Since I didn’t have the brownie pan yet (where this recipe came from), I had to slightly alter the recipe to make these in a regular muffin pan until I could get my hands on a brownie pan…so I’ll just tell you how to make them in a muffin pan for now. Preheat oven to 350 degrees. Spray muffin pan with nonstick baking spray with flour. Mix package of brownie mix according to package directions. Place 1 square of cookie dough in the bottom of each muffin well, press down evenly. 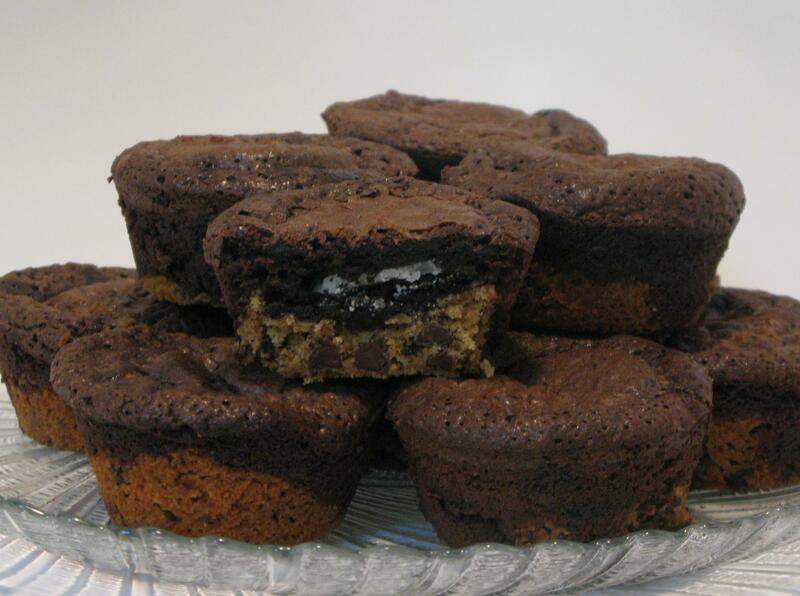 Top with 1 Oreo cookie (dipped in milk) and 1 Medium Scoop of brownie mix. Bake for approximately 20 minutes. *Dipping the Oreo cookie in milk is optional. This makes the cookie soft, so if you prefer crunchy Oreo cookies, just omit this step!